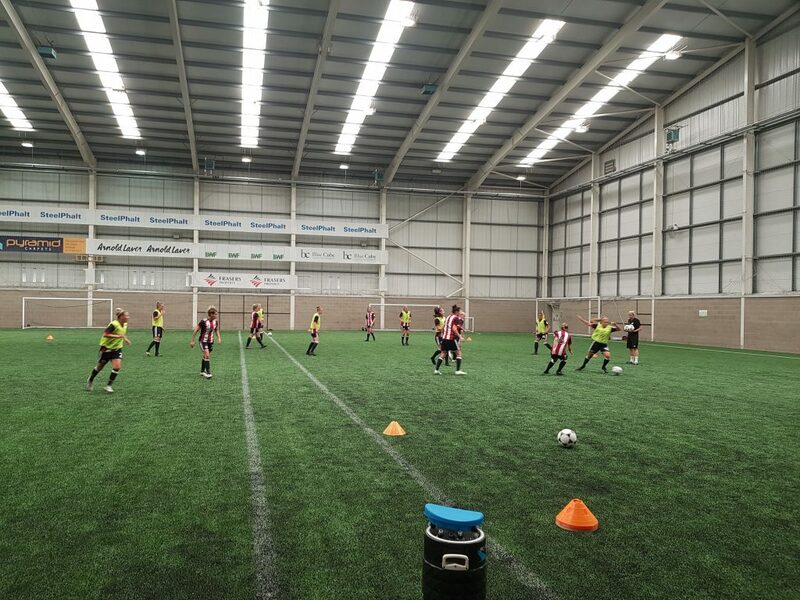 As Sheffield United get set for life in the second division of women’s football in England, Our Game Magazine was invited by the club to spend some time with the club as the squad prepares for the step up into the FA Women’s Championship. It’s 4:30 pm and the Charlton Athletic celebrations are just about beginning to subside. Riteesh Mishra’s side have just been promoted to the new FA Women’s Championship, a status other clubs await nervously as the Football Association now begins informing successful and unsuccessful applicants of which teams will be where for next season. Given Sheffield United is one of those teams making a bid, it’s kind of ironic the drama is unfolding in front of their very noses, deep inside Bramall Lane where the club plans to host their home games this season should their application be successful. Many other representatives from clubs around the tiers are also in attendance to hear the news face-to-face. Others will await dreaded phone calls or emails from their own corner of the country. Months and months of hard work, expense which some clubs can hardly afford just for a taste of football at the top level. Some clubs find out they’re successful, others aren’t so fortunate. Minute by minute the lounge above the reception empties and it’s just those nervous few from the Blades who remain. Manager Carla Ward is one of them, along with Head of Marketing Emma Kirk, friends, family, and players who likely know that realistically their futures will be plunged into doubt should the club be successful in making the two-tier jump into the Championship. Finally, Ward is called into the next-door boardroom to meet with the representatives from the FA who are there. It’s an anxious wait for many, speculation is rife about why United were left until last. “It’s good news, surely? They’ll leave the successful ones until the end,” one person said nervously. After what seems like an inhumane amount of time, Ward returns, poker-faced. The boss simply asks for a club polo shirt and dashes back out of the door. Nobody knows it just yet, but the club has just been informed they’ll have a spot in the new FA Women’s Championship for 2018/19. 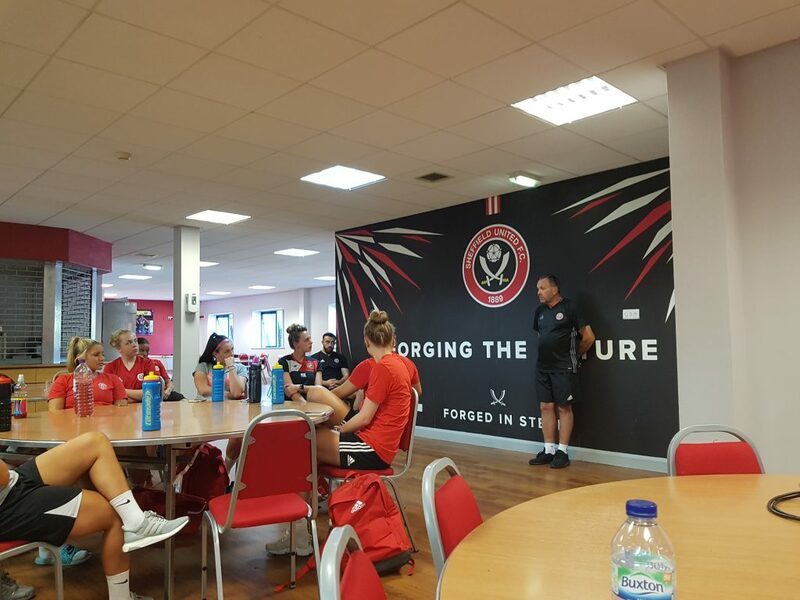 Carla Ward arrives at the Sheffield United Academy at 9:20 am, an hour before her new-look team are due in for a team meeting and a grueling two-hour training session in the scorching heat. 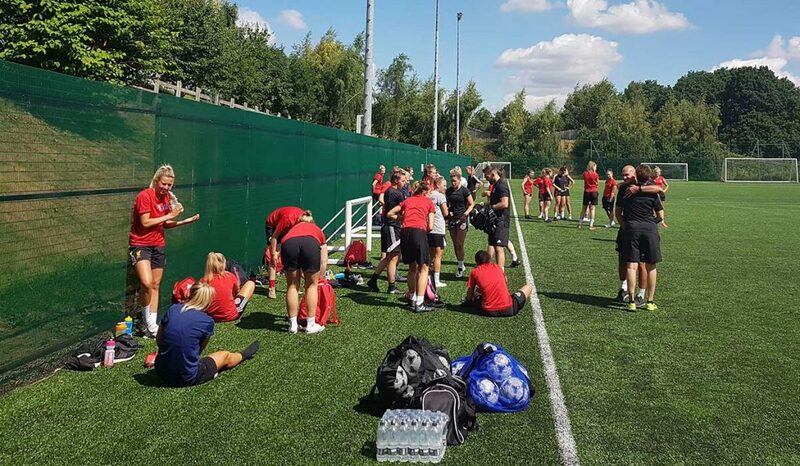 It’s just the team’s fourth session together as Ward continues to add players to her squad ahead of United’s first season in the new FA Women’s Championship. It’s been just six weeks to the day since Ward found out the club had been successful with its bid; six weeks to put a whole new squad together. After arriving as an assistant manager in November 2017, Ward took over as the new manager at the start of 2018 and has been tasked with following through with the club’s ambitious plans for life in the second tier of women’s football. As she arrives on Sunday morning to talk her new squad through a presentation explaining what she expects of them, who their staff will be and preseason plans, the new manager is happy to have her squad “almost complete” but admits the club pulled out of a couple of deals late in the day. Ward takes a no-nonsense attitude to building her squad. She cites “work rate and attitude” as crucial to her philosophy and hints some players didn’t have the commitment on and off the field that she was looking for. The academy United are based on is on the outskirts of Sheffield City center and on approach it looks like just another driveway on a winding housing estate. Tucked away behind the houses lies the home of all Sheffield United’s teams and both the women’s teams and their youth teams get equal access to the four outdoor pitches, one outdoor 3G pitch, and one indoor 3G pitch. Ward takes OGM on a quick tour of the facilities before heading to her office to talk through the training schedule with her strength and conditioning coach, Aden Flanagan. Attentions turn to a behind-closed-doors friendly with Huddersfield Town Ward has scheduled to get the squad a game under their belts before their first official friendly against Championship rivals Leicester City the following Sunday. 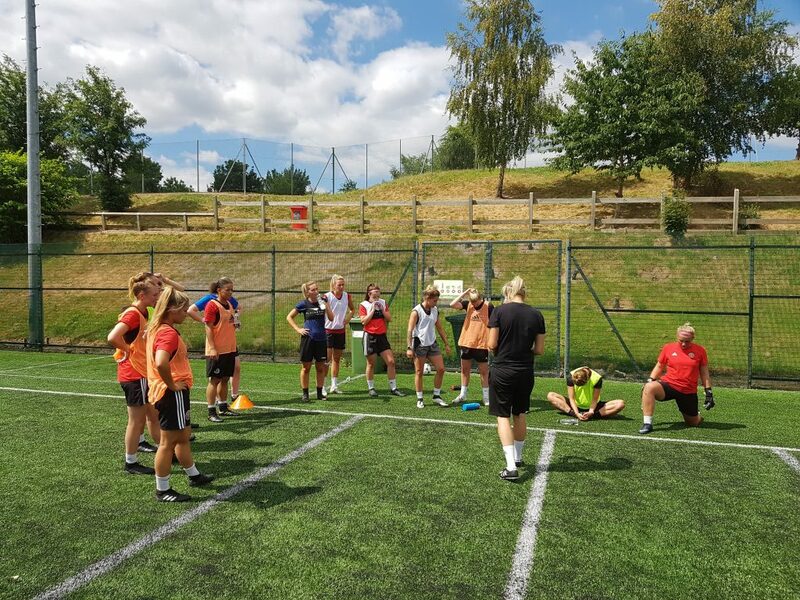 Ward has former Doncaster Belles player Lauren Cresswell and ex-Sheffield FC teammate Olivia Wild on trial with a couple of spaces left in her squad to finalize ahead of next month’s big kick off and the boss is keen to see what both can offer during a full training session. As the 10:30 am meeting approaches, players begin to arrive to see what the day holds. New signings have been turning up every session and today is no different. One of the club’s existing players, Georgia Stevens, is first through the door closely followed by new recruit Sam Tierney. One by one the new-look squad gel and make light chitchat about the previous day’s England match against Sweden, specifically whether Raheem Sterling or Marcus Rashford should start the upcoming semifinal. As part of their team bonding the players watched the second half, extra time, and penalties of the Colombia victory at the training ground post-training on Tuesday night with the club ordering in pizzas to help the players get to know each other. Former Birmingham City midfielder Maddy Cusack is the newest face through the door and it’s left to former Aston Villa teammate Beth Merrick to introduce Cusack who is also on trial at the club. A couple of players running late delays the meeting by 10 minutes and Ward is keen to hammer home her disappointment in the lack of time keeping from some members of the squad, a point also made to them by new Director of Women’s Football Mick Wadsworth. Stood at the back of the room listening to Ward grab the attention of her players, Wadsworth is part of a three-person coaching staff along with a new head coach. Wadsworth was part of Sir Bobby Robson’s staff at the 1990 World Cup and at 67-years-old, is seen as a vital part of the management staff along with new head coach Mark Smith who had a spell as caretaker manager at Sheffield Wednesday. Wadsworth is a man who instantly commands respect and he too addresses the squad. Instantly coming off as an intense character, he references the messages plastered around the walls of the training ground and reminds the new players about what they’re representing. One of those messages hangs above the entrance to the training ground’s gym, an old quote from legendary NFL coach Vince Lombardi: “Winning isn’t everything… wanting to win is,” a message aptly applied to a team being pieced together by a manager demanding 110 percent effort from her 15 new signings so far. Referencing Sheffield as the Steel City, Wadsworth discusses the ethos implemented by men’s manager Chris Wilder before handing it back over to Ward with his point firmly made. Discussion turns to an upcoming double-header friendly tournament against Durham and Newcastle, perfectly scheduled for a team-bonding trip away with Durham on a Friday and Newcastle the Sunday. The club will stay over for several nights in the northeast but one of the key issues of part-time football is laid bare as Ward asks her squad who might struggle to make the trip. Four players raise their hands due to work commitments on Friday so Ward won’t be able to take her whole squad away for the trip. Not all players are even at the meeting due to commitments elsewhere with new trio Nicola Hobbs, Danielle Cox, and one player yet to be announced by the club all absent from Sunday’s session, with permission from the club. Ward does request her players brainstorm potential ideas for team-bonding sessions while staying in Newcastle with ideas including bowling and an evening meal together. Another way of getting her team closer together is the fact they’ve been invited by the club to attend Sheffield United’s glamor friendly against Inter Milan at Bramall Lane on July 24, an evening in which the players will be guests of the club in hospitality in a bid to ensure the men’s and women’s teams continue to be treated equally. 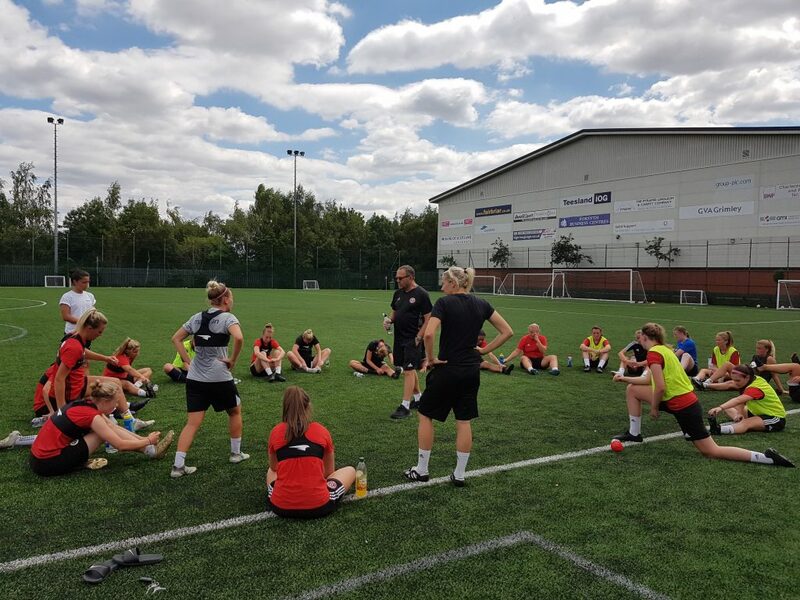 With a few other topics, including training kits and squad numbers covered, Strength and Conditioning Coach Flanagan talks briefly about upcoming fitness testing before the squad is sent out to the 3G training pitch ahead of a two-hour session, the first chance Ward will have to bring the majority of her new players together. After a quick warm-up, it’s immediately down to a tough passing session which tests some players who haven’t trained for several weeks to the max as the heat ramps up closer to midday. As Ward observes largely from the sidelines, Wadsworth takes a more hands-on approach and his demeanor changes instantly on the training pitch. The experienced coach dishes out plenty of tough love, joking to one player she has the “touch of a wheelbarrow” during the passing routine. But all in jest and welcomed by the players, Wadsworth is lighthearted with the players, happily joking with plenty of them but also happily stopping the session when he pleases to hand out any necessary criticism to individuals. As the session moves on to a small-sided attack versus defense match, goalkeeper Fran Kitching takes a close-range Sophie Barker volley to the face while Ward’s former Sheffield FC teammate Ellie Gilliatt is by far the most vocal, encouraging her new teammates to talk more and instructing on opportunities for her colleagues to find space for a pass. Trialist Olivia Wild scores a nice goal with her potential new boss watching on intently before a more than necessary drinks break brings a temporary halt to proceedings. Wadsworth decides to dish out a quick-fire question to see what the squad knows about the history of football. “What did Inter Milan introduce to club football during the 1950s?” The majority are nonplussed, but some are aware of the fact it was indeed the sweeper position, or “catenaccio” as Wadsworth reminds them. The final part of training gives Ward her first chance to get an 11-a-side game going, although several absentees means she has to call up five development players from their indoor fitness session to fill in the empty gaps. Less than 20 seconds in and Beth Merrick hammers home a volley to state her intentions for the upcoming season. Wadsworth temporarily postpones the match to tell the players how he expects them to set up from a throw-in before halting the session once more when they seem to forget his instructions at the next time of asking. Wadsworth is all too happy to drill the setup into the players again and again but does praise the squad for their good work at the end of the session, before once again quizzing them, this time on the Argentina 1978 World Cup team. Game day. Scorching hot. 3G pitch. A recipe for torture for those unfortunate few who are about to step onto the pitch and play their first game in nearly two months. The conditions couldn’t be tougher on both sides as Sheffield United gets set to face Leicester City in the home side’s first preseason friendly as a new team. Jonathan Morgan’s Leicester side are a little more match sharp but it’s also a good chance for one of Ward’s new competitors to test out some of his own new signings. The Foxes have a fair few on show as they line up on the burning astroturf to put Ward’s side through their paces. The game isn’t until 2 pm but that doesn’t stop Ward arriving at her office inside the club’s academy training ground four hours before at 10 am. Ward takes in a couple of meetings, including one with Wadsworth, who has just arrived back from a trip abroad, before she meets Lisa Ryan and her dad at reception. Center back Ryan came through the Sunderland academy with the likes of Jordan Nobbs and is returning to England after a spell in the United States. Ryan’s trialing with the Blades as Ward looks to put the final touches to her squad. One or two have been let go since the Sunday before while Lauren Cresswell was informed after the training session she’d done enough to earn herself a permanent deal for the season ahead. 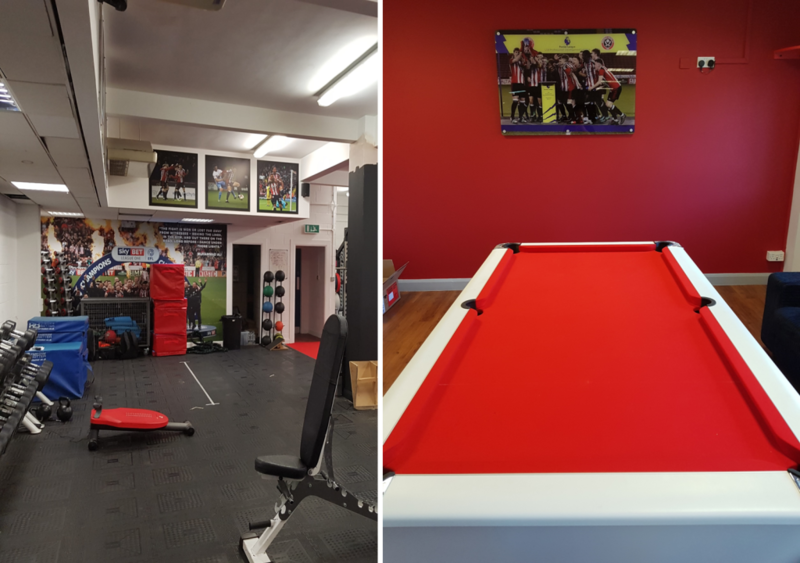 A couple of players are in early for a massage or some physio work, talk is no longer about the hope surrounding England and the World Cup campaign which was so alive and kicking seven days prior, but about the looming final between France and Croatia. Ward’s disciplinarian side once again takes over as she starts tidying and shifting the chairs around in the canteen. The academy girls side had been told about “standards” and leaving things tidy so Ward is less than impressed to see chairs far away from the tables they started the morning at. As more players begin to arrive, Ward and her staff and several squad members go to the viewing path above the 3G pitch they’ll soon be playing on to watch the respective development sides of both clubs take each other on. Come 1 pm and it’s back inside for a warm-up on the full-size indoor pitch, with Leicester in one half and Sheffield United in the other. 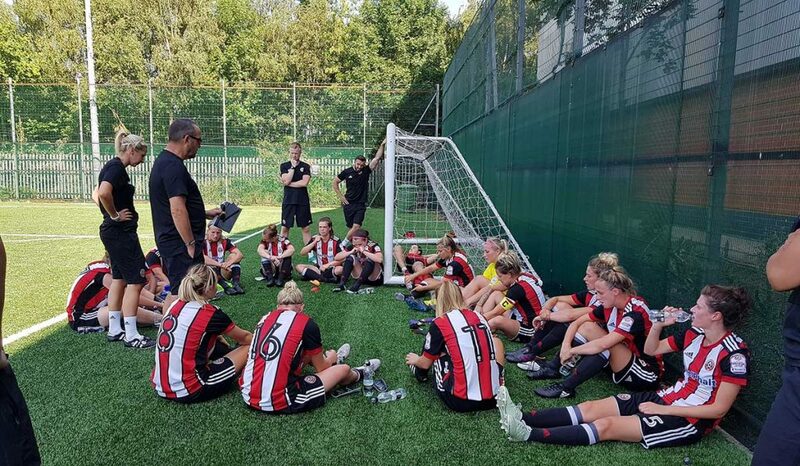 Ward picks her strongest 11 with the majority of younger players and existing Sheffield United players left on the bench, or in this case sat looking for some shade on the side of the pitch. Even if you wanted to take part in some mind games you couldn’t; Ward and her staff are on the other side of the pitch to Leicester, although some of the players are amused by Leicester’s pre-match huddle and their shouty enthusiasm given it’s a preseason friendly. Leicester are well on top in the early moments, and look like a side who has a game under their belt while United look like a team who has never played together. Ward tells her players to relax as some look nervous on the ball, spaces are being left, and runners not being tracked. A couple of early roll-on, roll-off substitutes do the trick momentarily until one of Leicester’s new signings runs through and slots the ball beyond Fran Kitching. It’s a frustrating start for the new squad. Things aren’t coming off, one ball down the flanks has Wadsworth shouting, “Usain Bolt wouldn’t have got on the end of that” to the guilty player in question. A scheduled water break comes at a timely moment for Ward and Wadsworth. The former berates her team for being too “one paced” and allowing Leicester to win the ball back too easy. Trialist Ryan is sent on and immediately makes an impression. Tall and imposing at the back, she even does enough to get a compliment out of Wadsworth. The second half is a much better affair for the hosts. New signing Lauren Cresswell is sent on and has the desired effect when she taps home a cross from close range to make the score 1-1. Ward’s side really should nick it. Leicester look tired and Cresswell combined with the feisty Ellie Gilliatt down the left is stretching Leicester. Ward’s happier with what she sees, though Gilliatt introduces herself to one of Leicester’s new signings in traditional fashion as the pair square up to each other after a battle to win the ball. Chatter on the sideline extends as far as Manchester United’s new squad and their friendly against Liverpool, which is taking place at the same time. Some are happy just to be in the shade as the sun continues to beat down on the academy as the referee brings proceedings to a halt just in time for the World Cup final. Timely. One by one, the players make their way back to the changing rooms with part one of the job done. The first preseason friendly is in the bag and goodbyes are said as players head off in their cars or with their families to see what they can of football’s showpiece occasion. Some players are aware they’ll miss the lot given their commute back home, while others are glued to their phones for a glimpse of the spectacle. The players now have to recover in time for a double matchup against Durham and Newcastle United at the end of the week.